What Will Happen If Roe v Wade is Overturned? 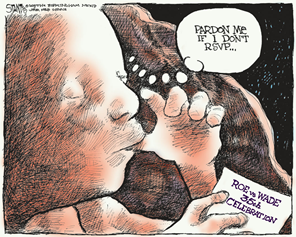 Roe v. Wade is one of the most famous court cases in the history of the United States Supreme Court. It essentially made abortion legal for all nine months of pregnancy . While the majority of Americans are actually pro-life (therefore, they do not support Roe v. Wade) , what many people do not realize is that overturning Roe v. Wade will not likely result in all preborn lives being given protection overnight. Instead, the much more likely scenario is that the fight for preborn rights will have to be fought in each and every state, through the through the democratic process. Overall, this is good news for the pro-life movement, as well as preborn babies! It means that pro-life states will quickly be able to establish legal protection for the lives of the unborn and a strong culture of life will be able to begin to take hold. In other words, overturning Roe v. Wade may be a necessary first step. However, that by itself will not be enough to build a strong culture of life. In order to change the culture and end the demand for abortion altogether, the pro-life movement must also focus its efforts on educating the public and reaching out to women. This outreach must always be genuine, with the goal of providing women facing unplanned pregnancies with much needed love, compassion, and support. Saad, Lydia. (2011). “Americans Still Split Along “Pro-Choice,” “Pro-Life” Lines.” Gallup, 23 May 2011. Web. 1 Jun 2011. http://www.gallup.com/poll/147734/Americans-Split-Along-Pro-Choice-Pro-Life-Lines.aspx.